Well this funny meme hit a little close to home. Is it still a meme if its only text and no picture? Anyways, after I laughed, I sighed with the realization that this is pretty much me. 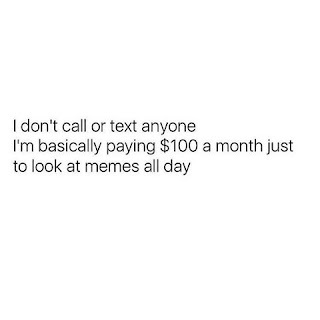 I don't even come close to using my smartphone to call or text enough to justify the "unlimited" plan I have, But I do catch myself scrolling through my Facebook feed way too much. I am getting better at it. I know that Facebook is a huge drain on my productivity. 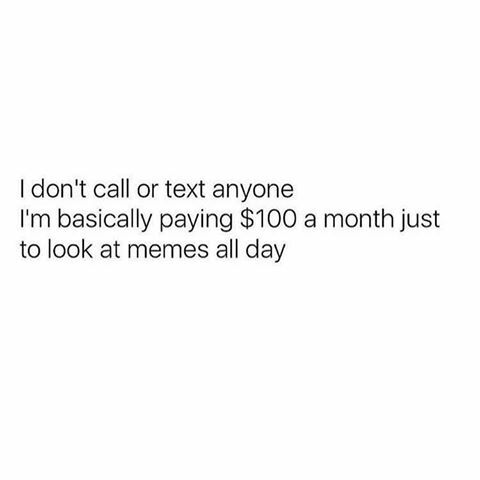 Far as the calling or texting, I really don't no if I'll ever increase that enough to ever truly justify the unlimited data. It's kind of like a paradox. I could simplify my life by getting rid of the unlimited data plan or even the smart phone all together. I will increase productivity and stretch my budget at the same time, making life simple. But having the everything included, don't have to worry about minutes or data makes life simple too. I said "it's kind of like a paradox" because it really is not. The part about an unlimtied data plane making things simple is just an excuse I (we) tell ourselves to please our inner child who want the gadget with all the bells and whistles.